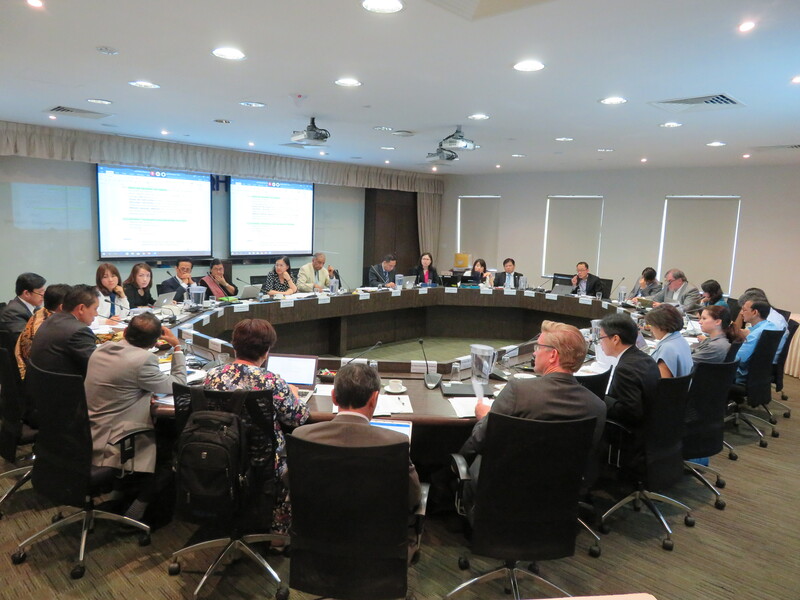 On 31st July, the 21st Governing Council Meeting of the APWF was held at the Singapore PUB WaterHub. It was organized as part of the Asia-Pacific Regional Process Consultation Meeting for the 8th World Water Forum and chaired by Mr. Ravi Narayanan and Ms. Changhua Wu in their capacities as Chair and Vice Chair of the Governing Council of the APWF. 28 representatives from the APWF Partner Organizations, with additional 5 members through remote connection, participated in the meeting. The objectives of the 21st APWF Governing Council Meeting was to discuss the themes of 2 important APWF initiatives: (1) the 3rd Asia-Pacific Water Summit (the “3rd APWS”), and (2) the Asia-Pacific Regional Process for the 8th World Water Forum, and to confirm the roadmap of each event’s process. The APWF Secretariat and a representative of the host country shared the current situation on the 3rd APWS. The participants then discussed the parallel session themes and exchanged their organizations’ possible contribution to the 3rd APWS. They also examined how to integrate the interests and priorities of the host country into parallel thematic sessions in the way of being reflected in the messages to be delivered in each session. Then a consensus was made that the feedback from this meeting should be reflected into the 2nd joint steering committee meeting scheduled a few weeks later between the APWF and the host country, and that they will discuss further based on the outcomes of the meeting. Followed by sharing the overview of the current situation of the regional processes for the 8th World Water Forumby the APWF Secretariat, , regional process theme leaders shared their first concept notes and their preparatory processes for the 6 themes of the 8th World Water Forum (Climate, People, Development, Urban, Ecosystem, and Finance). The participants then exchanged the opinions and feedbacks, including how to inter-link the relevant topics with the 6 themes by providing quantitative and qualitative data and lessons learnt from case studies. Each sub-regional coordinator from Central Asia, Northeast Asia, Oceania & Pacific, South Asia, and Southeast Asia also made comments such as how they could contribute to the themes by sharing on-site experiences and possible case studies. The representatives also discussed how to inter-relate the themes of Asia-Pacific Regional Process into the themes of the 3rd APWS, and how they could deliver tangible and actions-oriented messages, solutions for water security, and how to achieve Sustainable Development goals in the Asia-Pacific region. Then the reporting process and schedule was confirmed. The APWF Secretariat, International Water Centre and Global Water Partnership China shared information on their events to be held in the Stockholm World Water Week 2017. The APWF Secretariat also shared future activities beyond the 3rd APWS and Asia-Pacific Regional Process for the 8th World Water Forum.